OBJECTIVE: Patients with ventral hernia repairs risk mesh infection with subsequent surgeries, which can lead to serious morbidity. Such patients need an unorthodox approach to prevent serious complications such as mesh infection or recurrent hernias. METHODS: Patients who had large ventral hernia repairs and subsequently underwent laparoscopic procedures for various purposes were retrospectively reviewed. The aim of the study was to report our experience, technique and short term outcomes for this group of patients. RESULTS: A total of 7 laparoscopic procedures were performed in 6 patients. Mean age was 36 with a mean BMI of 48. The cause of the original hernia ranged from splenectomy, small bowel resection to colectomy. Four patients had a laparoscopic ventral hernia repair with a mesh while two patients had a component separation with myo-fascial advancement done. The average size of the mesh used was 30 x 20 cm. Mean time between the 2 surgeries was 25 months. The 2nd procedures were all laparoscopic and included 2 Roux-en-Y gastric bypasses, 2 cholecystectomies, 1 splenectomy, subtotal colectomy and bilateral inguinal hernia repair with mesh. Abdominal access was attained in all except 2 patients via a RUQ or LUQ incision with blunt dissection using a gloved finger. An average of 1-2 extra trocars had to be placed for adhesiolysis. All trocar sites through the mesh were sutured using a suture passer at the end of the procedure. Mean OR time was 182 minutes while the mean time spent on adhesiolysis was 44 minutes. Mean EBL was 118 cc. One patient had a port site infection followed by an abdominal abscess which needed IR drainage while another patient had a recurrent hernia requiring surgery. None of the patients required conversion to an open procedure. No mesh infections and bowel injuries were seen. Mean hospital stay was 4 days while patients started PO diet at a mean of 1 day postop. No mortality was seen. Mean follow up was 9 months. CONCLUSIONS: Laparoscopic procedures after large ventral hernia repairs are safe and have a low complication rate. 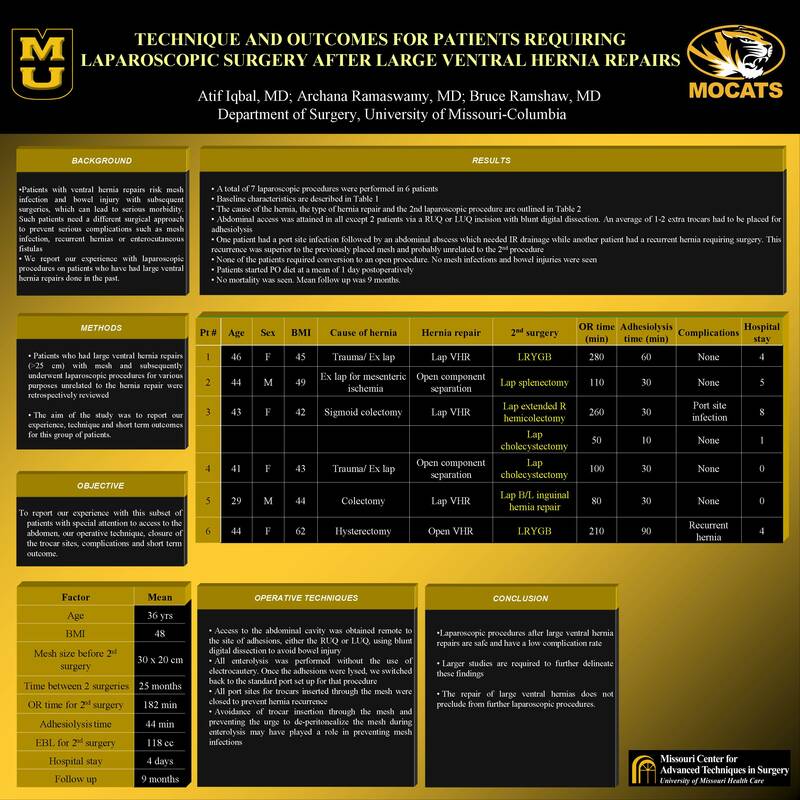 The repair of large ventral hernias does not preclude from further laparoscopic procedures. Larger studies are required to further delineate these findings.